Located on the Las Vegas Strip, just minutes away from shopping, casinos, and endless entertainment. Burger Brasserie - Gourmet burgers, Mon Ami Gabi - Al fresco dining, Martorano's - Italian cuisine, Gordon Ramsay Steak, Hexx Kitchen + Bar - American style cuisine, Eiffel Tower Restaurant - French cuisine, Cafe Belle Madeleine, La Creperie, JJ's Boulangerie - Sandwich café , Le Cafe Ile St. Louis, Le Village Buffet, Yong Kang Street - Dumpling and noodle house. 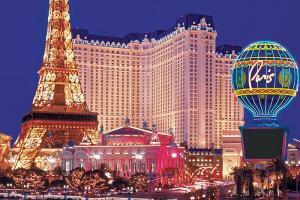 Casinos, Nightclubs, Entertainment, Shows, Shopping, Bus Tours, Exhibits, Hoover Dam.